Microtel Inn and Suites by Wyndham Clarion announced that it has awarded a multi-product, turnkey technology solution project to ITG Networks of Cranberry Township, PA for the new sixty-eight-room Microtel Inn & Suites located on I-80 at Exit 62, 121 North Point Drive, Clarion, PA 16214 inside Trinity Point at Monroe. 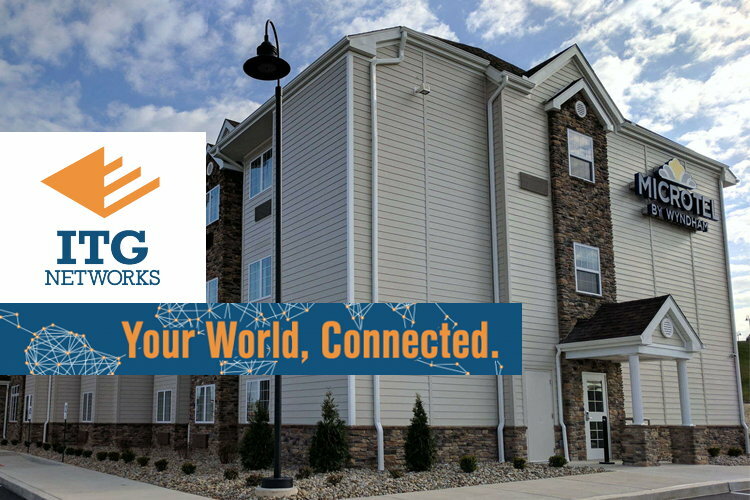 The new hotel, which is part of the gateway to the Pennsylvania Wilds, Cook Forest State Park, and the Allegheny National Forest, will support its guests with a robust, state-of-the-art technological network that features Hospitality PBX, Intelligent Guest Wifi (HSIA) and top of the line 24/7 Support System. ITG was tasked with designing a complete technology solution that met the needs of a demanding clientele as well as the requirements of property management, reservations, and administration. In addition, Microtel desired a solution that was prepared to scale with as well as accommodate future technologies as they emerge. ITG’s scope of work included Wired and Wireless Guest Internet, Hospitality PBX, CCTV, Sound System, and Low Voltage Cabling. Microtel Inn & Suites by Wyndham Clarion now enjoys a technology infrastructure that features a cost-effective and custom-developed network to benefit the administration and its guests. As part of the installation, ITG Networks maintained an efficient, on-time installation with its experienced project managers that worked within the hotel’s deployment timeline needs from blueprint to hotel opening. As the project comes to a close, ITG has implemented guest wi-fi across 68 guest rooms and through the administrative areas and common rooms. ITG is also responsible for enhancing security through the design and placement of CCTV technology throughout the property and its structures. Finally, with their commitment to meeting guest expectations, ITG was responsible for providing Microtel staff with front desk training to ensure that guests receive fast and responsive support. This focus on Microtel Inn & Suites guest satisfaction is one of many reasons why ITG’s service level agreement (SLA) is highly regarded. ITG Networks provides turn-key network solution installations by combining 24/7 end-user support with scalable network solutions. They deliver comprehensive and individualized solutions that provide Wifi with ROI, an application rich ecosystem based on robust, intelligent WiFi, coupled with a variety of applications enhancing the experience of the end user. These applications range from smartphone apps to wireless statistics for business analytics, location-based services, network user identity and single sign-on. ITG has over 50 years of collective telecommunication industry experience helping customers with rapid development and deployment of WiFi networks. Property owners, managers, developers, and hospitality companies rely on ITG for enhanced digital services for guest units, meeting rooms and public areas. Their “Whatever it takes!” motto and personal attention to service have earned ITG a reputation for providing efficient solutions that meet evolving customer demands. Headquartered in Cranberry Township, Pennsylvania, ITG Networks supports clients throughout the continental United States, including Alaska. Learn more at www.ITGNetworks.com. Wyndham Hotel Group is the world’s largest hotel company based on a number of hotels, encompassing nearly 8,000 hotels and approximately 679,100 rooms in 73 countries. Part of Wyndham Hotel Group, the Microtel Inn & Suites by Wyndham brand is an award-winning chain of more than 330 economy hotels located throughout North America and the Philippines. Designed to provide guests with a better hotel stay, each hotel is newly constructed and offers an array of complimentary amenities including free Wi-Fi. This new sixty-eight-room hotel offers guests ten singles, forty-six doubles and twelve suites. Learn more at www.microtelinnandsuites.com/hotel/49818. The Microtel Inn & Suites, Clarion was developed by Pinnacle Resource Management. The project was spearheaded by the President of Pinnacle Resource Management, Mr. Timothy Reddinger, who has more than 15 years of experience in real estate development, consulting, and project management. Additionally, Mr. Reddinger is the General Partner of NPD Enterprise-1 LP, the company that owns Microtel Inn Suites, Clarion PA.
Are you with ITG Networks? If you are a member of ITG Networks you may be interested in learning how to optimize your content on our network.